The logo designs on the Google homepage, or doodles as you might have noticed change every day. The aim is to bring the dull Google home page up a bit by celebrating different people, events or special dates. These doodles are usually created by our Google web designers. However, for the fifth year running Google is inviting Irish students to create their own doodle by taking part in the Doodle 4 Google competition! Fancy having your own doodle appear on the Google Ireland homepage for 24 hours? The winner will also receive a €5,000 college scholarship, a €10,000 technology grant for their school as well as a laptop for themselves and one for their teacher! This year’s theme is ‘My invention….‘ We’d love to see doodles inspired by inventions; whether whether its’ a unique or novel device, a new method of doing something or changing an existing process. For example a time travel machine, a new sport or toy, a medical creation or simply a new way to do something old. The 18-year-old winner of 2012 Doodle 4 Google was Patrick Horan. From Clonlara in Co Clare, Horan is a sixth-year student at St Munchin’s College in Limerick. 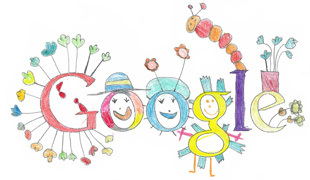 It’s the second time a student from St Muchin’s has scooped the Doodle 4 Google accolade. Back in 2009, Evan O’Sullivan Glynn won the very first Doodle 4 Google competition in Ireland. My picture is about the things that make me feel happy. In my picture you can see love hearts, curls, shamrocks, people with fancy hats, people going on a bear hunt, grass men, plants, shamrock plants for Ireland, grannies and a caterpillar because I like searching for caterpillars. I used different colours in my picture because it looks nice. I like my picture! We like your picture too, Layla. Congratulations! The deadline for entries to Doodle 4 Google is 10 December 2012.